What Day Of The Week Is June 5? 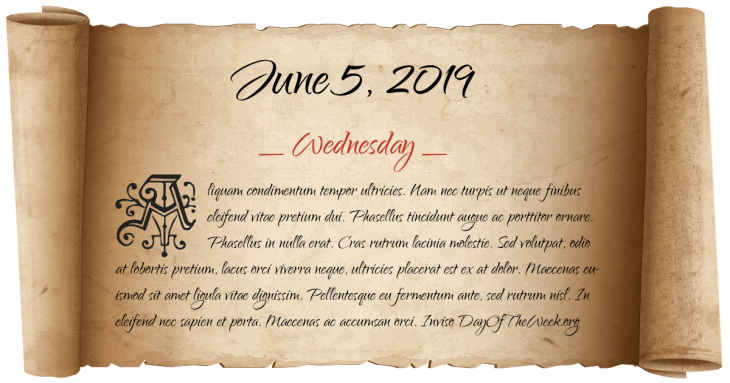 June 5, 2019 is the 156th day of the year 2019 in the Gregorian calendar. There are 209 days remaining until the end of the year. The day of the week is Wednesday. The June Rebellion breaks out in Paris in an attempt to overthrow the monarchy of Louis-Philippe. A fire in the La Salle Hotel in Chicago, Illinois kills 61 people. Marshall Plan: In a speech at Harvard University, United States Secretary of State George Marshall calls for economic aid to war-torn Europe. Elvis Presley introduces his new single, “Hound Dog”, on The Milton Berle Show, scandalizing the audience with his suggestive hip movements. U.S. presidential candidate Robert F. Kennedy is shot at the Ambassador Hotel in Los Angeles, California by Palestinian Sirhan Sirhan. Kennedy dies the next day. The International communist conference begins in Moscow. Portions of the Holbeck Hall Hotel in Scarborough, North Yorkshire, England, fall into the sea following a landslide. Tropical Storm Allison makes landfall on the upper-Texas coastline as a strong tropical storm and dumps large amounts of rain over Houston. The storm caused $5.5 billion in damages, making Allison the costliest tropical storm in U.S. history. Serbia declares independence from the State Union of Serbia and Montenegro. Who were born on June 5?